A few days before we were going to be in Queenstown I looked online for a hotel but the town was so crowded in February that I couldn’t find a single place to stay. None. Zero. I did, however, find an opening at a hotel in Glenorchy, at the northern end of Lake Wakatipu about an hour north of Queenstown. That turned out to be a good thing because I don’t know if we’d otherwise have taken the scenic drive along the eastern side of the lake. 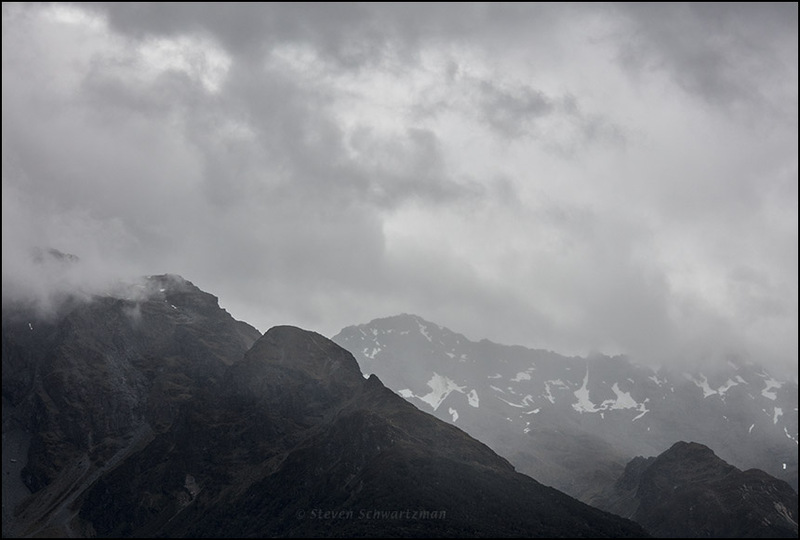 The picture above shows the mountains outside Glenorchy late in the afternoon on February 21st. Notice once more that fields of ice had lasted into the warmest part of the year. It was, and so shall remain in memory. Very atmospheric. I am remembering now that on our visit to Glenorchy, the tour vehicle broke down. We had to wait for some hours in a small cafe while another vehicle was sent from Queenstown. The sky was dark and moody, as in your first photo. Atmospheric is a good word for it. I’m sorry you had to wait hours, but glad you got to see Glenorchy and the part of Lake Wakatipu north of Queenstown. It was also good that the cafe stayed open after hours so we could all stay warm and dry. Or the rainbow found you! I can really see the colors in the spectrum. I’d guess the pot was close by. The overcast sky made for good photos! No pot of gold, but a cache of photographs was my reward. I agree with you that the overcast skies worked well. I was happy to find them. These photos are stunning. It is so interesting to see what goes on down under, so far from here. I’m thinking I am going to begin writing a blog/newsletter directly from my website, and if it works, will stop writing this one. Or maybe I’ll keep writing this one but only respond to a few friends like you and Jim and Steve G. My blog on the website will be more about the new directions I want to take my art. I’m wanting to go more inward, perhaps abstract as we have discussed before. I fear that not everyone will like them but nevertheless, my heart is calling. Also, for some reason I wasn’t getting your posts in my inbox again so I’ve re-subscribed and hopefully will be getting them again. I hope one day you’ll get to see that down-under world in person. One possibility is to write your posts on your website, then copy each one to your WordPress blog. That way for the same amount of creating you’d get extra exposure. You may be right that not all of your current subscribers would be interested in your new directions, but some would be. I know I’ve often gotten less apparent interest in the more-abstract pictures I’ve posted here. C’est la vie. Oui, c’est la vie. That’s true~what a good suggestion. Right at the moment I don’t know what any of it is going to look like. No doubt the NZ trip is one to be remembered. And that rainbow!! I know it’s just water droplets and sunshine, but wow. Glad you got to go! We missed our opportunity two decades ago when a job prospect squashed our trip plans. Hopefully again in the near future…when the kids are out of college. As you say, water droplets plus sunshine can make for quite a wow. The very next day we saw rainbows created by the spray from waterfalls (as a future post will reveal). I do hope you won’t have to wait too long to revive your postponed plans for a New Zealand visit. For someone who loves the outdoors as much as you do, New Zealand has a huge number of accessible trails—more than any place I’ve ever been to. When I was in Hawaii, there were rainbows everywhere. Especially on Kauai, there could be multiple rainbows, every day. Now I’m wondering if New Zealand might provide some of the same delights. 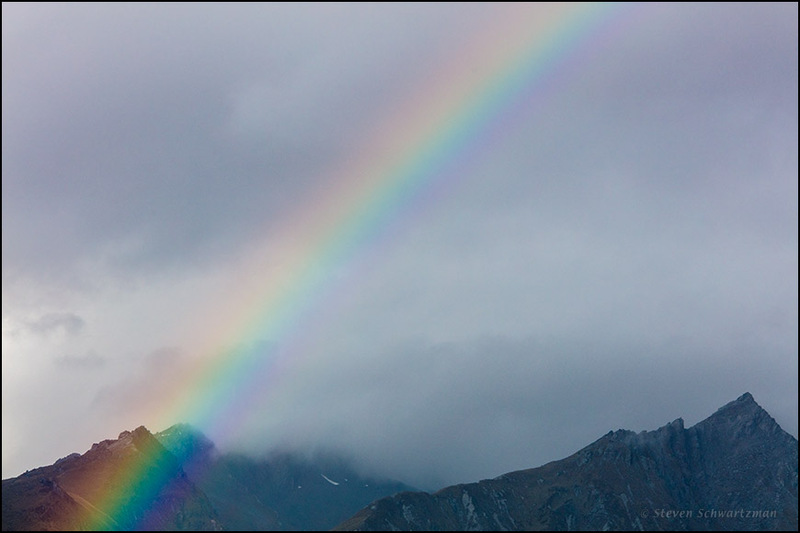 With the mountains, waterfalls, forests and what seems to be frequent rain, I have a sense that it might be as congenial a place for rainbow formation as the Hawaiian Islands. No rainbows for me yesterday afternoon, but I did get up-close-and-personal with my first bull nettles. In fact, I sat on some. I’m going to try not to do that again. Yes, I can confirm that there are plenty of rainbows in New Zealand, thanks to lots of rain and lots of waterfalls. And yes again, many nature photographers prefer “weather” to clear blue skies. Ouch for the bull nettle. I’m sorry to hear you sat on some. That’s a close encounter of the hurts kind. Oh my, the “end” of the rainbow seems very unusual. Gorgeous shot, Steve! Thanks, Lynn. I think you find the end of the rainbow unusual because it looks brighter against the dark mountains than the rest of the rainbow looks against the sky. I think it is because it extends down so far with the mountains behind it – I don’t think I’ve ever seen a rainbow that continued into the earth like that. Then for your sake I’m grateful for the novelty. Beautiful rainbow .. glad you found that accommodation! So are we. It worked out for the best.